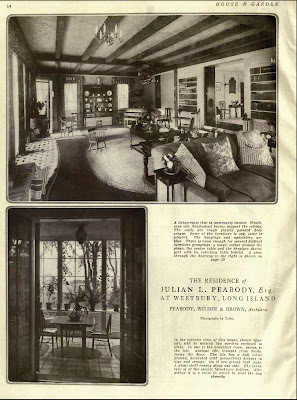 'Pond Hollow Farm', the Julian L. Peabody estate designed by himself c. 1910 in Old Westbury (Peabody being of the firm Peabody, Wilson & Brown). Click HERE for more on 'Pond Hollow Farm'. 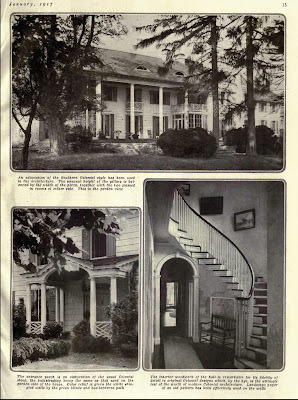 Just sold last month was the Julian Peabody designed winter colony mansion "The Balcony" in Aiken, SC. He created it for the son of Woolworth co-founder Seymour Knox. Peabody (married into the Hitchcock clan) died so relative early in the sinking of the Mohawk that who knows what he might have continued to create with the money and connections.